I have always believed in quality of the products. I am reviewing two products belonging to reputed brands. Lakme Absolute : Argan oil ruby velvet colour . And L'oreal Paris Star collection :Frieda Pinto pure rouge colour. Lakme Absolute : Argan oil ruby velvet colour - the packaging is very glamorous shiny golden colour. Very trendy, light in weight. L'oreal Paris Star collection :Frieda Pinto pure rouge colour - the packaging is classic black colour. Very common in terms colour black but classy. Lakme Absolute : Argan oil ruby velvet colour - stays for long period of time. Even after eating the lipstick colour is still present on the lips. L'oreal Paris Star collection :Frieda Pinto pure rouge colour- does not stay for long period of time. Needs to be reapplied after eating. As the lipstick colour faints and requires frequent reapplication. 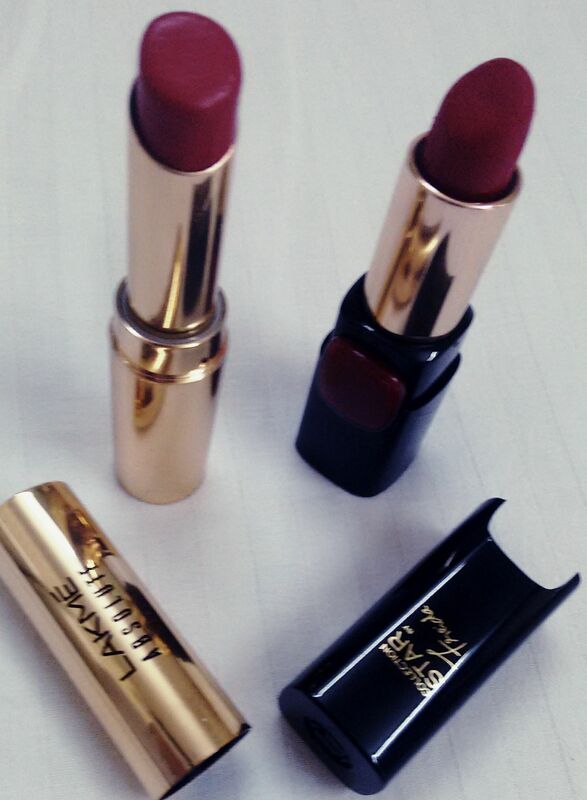 Lakme Absolute : Argan oil ruby velvet colour : Has a creamy texture due to the argon oil present in the lipstick. It has duel purpose it can be used as coloured lip balm and as a lipstick. L'oreal Paris Star collection :Frieda Pinto pure rouge colour: this also has a creamy texture, however it does require applying a lip balm before applying the lipstick. Lakme Absolute : Argan oil ruby velvet colour- the colour is red but has a hint of orange in it . Very fresh, trendy ready for winter season. L'oreal Paris Star collection :Frieda Pinto pure rouge colour - the colour is red but has hint of dark mauve in it. It gives a classy look on applying. And the winner is Lakme Absolute : Argan oil ruby velvet colour.